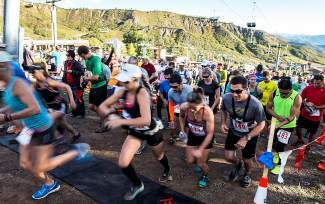 Runners break from the starting line in Snowmass Village in 2013. Rickey Gates and his red mustache collected gold Saturday in the 35th annual Golden Leaf Half-Marathon. Gates, an Aspen High School graduate and globe-trotting professional trail runner, won the 13-mile race from Snowmass Village to downtown Aspen for the first time in his distinguished career. After a string of four second-place finishes in the Golden Leaf, the 32-year-old Gates won Saturday’s race in 1 hour, 26 minutes, crossing the finish line at Koch Lumber Park with a huge smile under his sweeping, red mustache. While Gates broke the spell of four second-place finishes, women’s winner Stevie Kremer extended her Golden Leaf streak with her fourth career victory in Aspen — 1:37, good for eighth overall. Kremer, who recently returned from a season racing in Europe, adjusted her tactics a bit in her fifth Golden Leaf race, sponsored again this year by the Ute Mountaineer, Salomon and the city of Aspen. And it was her best finish time ever for the course that climbed the Snowmass ski area before turning down Government Trail for the up- and-down run into Aspen. “My fastest time before was 1:43; this was much faster,” said the Connecticut native who moved west for college. After attending Colorado College in Colorado Springs, Kremer said, she moved to Crested Butte. “It wasn’t until I moved to Crested Butte, to the real mountains, that I discovered my passion for them,” said Kremer, who also is a top ski mountaineer on the competitive circuit. A member along with Gates of the Salomon Running Team, Kremer is the women’s record-holder on the Mount Evans Hill Climb in Colorado. She’s also a winner of the Mont Blanc Marathon in Europe. And men’s runner-up J. Marshall Thomson, of Crested Butte. Thomson, a familiar name in ski-mountaineering races (including his victory in the Grand Traverse backcountry race from Crested Butte to Aspen), dueled with Gates early in Saturday’s race. Gates, who finished second in the famed Mount Marathon climb in Alaska this year, made his move on the last of the uphill sections halfway through the Government Trail. One of the first to congratulate Gates in the finish area, along with his family, was Aspen High School cross-country coach Chris Keleher. “That was really cool to see,” Keleher said of Gates’ victory Saturday morning. “Zeker (Zeke Tiernan) has won this race; now Rickey’s won it,” Keleher said of the Aspen High School alumni who have graduated to trail-running success. “It’s good to see these guys coming back here and running, and running well,” said the Aspen High School coach. Keleher said the runners of all ages in Saturday’s Golden Leaf Half-Marathon made a strong impression on the current Aspen High School runners, who volunteered as course marshals again this year. Keleher, a disciple of developing running as a lifelong pastime, said the Golden Leaf extends the message. Keleher’s coaching colleague at Basalt High School, running veteran Ron Lund, completed Saturday’s Golden Leaf Half-Marathon for the record 35th time. He’s the only runner to have participated in all 35 races from Snowmass Village to Aspen. Women’s runner-up Laura Tabor, of Boulder, also was happy to finish upright with no mishaps on the occasionally rocky and rooty course. She eventually finished just nine minutes back of Kremer in 1:46, 17th overall. A former high-school runner in New Hampshire, Tabor ran at Dartmouth College before moving west. Complete results of Saturday’s Golden Leaf Half-Marathon will be available on the Ute Mountaineer website (utemountaineer.com). Gates, who has competed all over the world, said one other factor helped in Saturday’s Golden Leaf victory — green leaves still on the aspen trees. Even the changing golden leaves couldn’t keep up with Rickey Gates and his red mustache this year.